Add your own ansi or use defaults. Only display latest X news without losing older ones. Can output oldschool cp437 ansi and utf-8 encoded files. None required. Simply run newsmag.pl or newsmag.pl -h for help. By default, newsmag searches for the input text-file and all templates at the directory, you're in while running the script, but you can provide alternative paths and filenames for everything. Check newsmag.pl -h for a list of all available options and their default values. 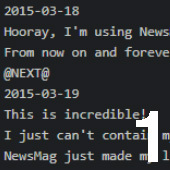 Order doesn't matter, NewsMag always sorts the input by date, newest first. This file holds your header template to be displayed above all the news. It has no special variables (yet).. This file holds your footer template to be displayed beneath all the news. It can hold one special variable: @COPYRIGHT@ - Will be replaced by a short copyright notice. If omitted the notice will be auto-appended below the footer. Will be replaced by all the lines between the second and the next one containing the tag "@NEXT@" (See section "INPUT FILE") Also takes all characters to the left and repeats them on subsequent lines. You can pad these variables to fit into your template files by appending <length><direction>@. This will pad the date to 16 characters by adding whitespace to the left. This will pad the subject to 32 characters by adding whitespace to the right. Content lines are wrapped to 75 characters by default. Also, all characters to the left of the @CONTENT@ tag in your template.ans are repeated on subsequent lines. You can change the line width by adding <width>@ to the variable. This will wrap lines at 70 characters. If any of these template files are omitted or not found, NewsMag will use very simple, hardcoded defaults. 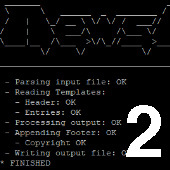 Some BBS systems automaticaly display files called "news.ans" at the login process if they have changed since the users last visit. some other systems have to be configured that way. 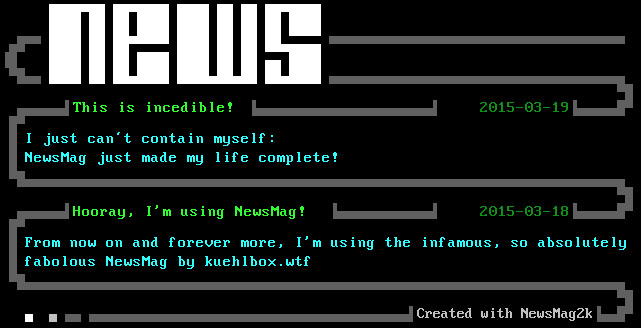 Now, users will see the news.ans inside the "text-directory" of your BBS (default: /mystic/text) everytime they log in and the file has changed since their last login. At the moment, the attached .mps is simply the onlyonce.mps, which comes with MysticBBS, but with a "Pause Prompt" at the end. Probably, I'll enhance it later..